While casually browsing flipkart I'd stumbled upon this book, with a fairly long title "How I braved Anu Aunty and co founded a million dollar company". I didn't have any serious expectations from it. I had thought it to be some fiction and added to my kart purely because it was priced under Rs 100 and buying it would clear me the minimum amount target for shipment charge waiver. After receiving the book few weeks ago, it didn't get my priority for various reasons and I read it only this weekend. It turned out to be an insightful as well as entertaining read. More importantly, it is no joke or humor but real story by and large. Varun agarwal is the author of this book. He is also the co founder of almamaterstore.in, an ecommerce initiative that sells school specific merchandise (like t-shirts) to alumnus of respective schools. The Book "How I braved Anu Aunty and co founded a million dollar company" is his experience account in overcoming personal challenges and setting up this company, which is now valued at over a million dollar. 1) Entrepreneurship Ideating a new concept, nurturing it and and make it happen and then grow the start up into a respected brand/company. Good explains author's challenges while creating his company and making it grow, lots of tips and so on. 2) The influence of naysayers i.e people who discourage you from trying anything unconventional, anything risky. The people who feel "study-get a job-get married-have family-repeat the cycle"- is everything in life. 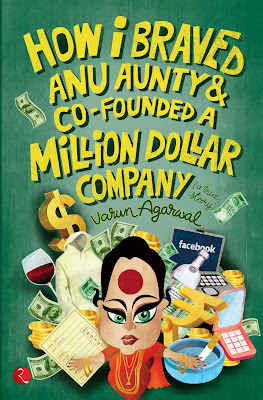 Anu aunty in this book represents a lady who constantly made fun of the author for not getting a decent job. She makes author's mom feel ashamed in the company of other ladies, by often comparing Varun to others who have better monthly incomes. Book also has some tracks on friendship, love etc, but that's very secondary to the core content- the start up. Varuns love angle with Devika is not taken to a logical conclusion. The plot is concentrated around Bangalore. Besides Kannada slangs and introducing Bangalore's pubs, I feel adding few words about start up infrastructure/support available in Bangalore- such as OCC (Open Coffee Club), Incubation centres at IIMB, Events like Startup Saturdays would have been great. Do grab a copy and read. It is worth. E-Book is also available. As far as non-collectible books are concerned, librarywala.com works best for me. Economical way to read books. YMMV. To the last bullet - the inspiring story of Braveheart Ashok Kamte.
" This is the extraordinary story of Ashok Kamte, Additional Commissioner of Police, East Region, Mumbai who died fighting terrorists in the 26/11 attack on Mumbai "
I posted your review on my blog today.